Rated 5 out of 5 by Firehorse66 from Lots of puzzles & long play time :-) I loved this game, especially for it's length. The bonus game was a decent length the extra chapter is not an extra chapter just an interactive Hos which I liked. The shards were hard to find but I only missed 3. It was fun to look for them. Lots of artistic value, beautiful and creative scenes and characters. Loved all the puzzles, had to skip 3 because I got impatient but most were fairly easy but fun and creative. Most of the hops were interactive thanks, I hate the boring piles and not too many but still I could have done with less. Rated 5 out of 5 by boatgirl4347 from WILL YOU BE MY GRANDMA PLEASE!!!! AFTER READING THE FIRST 5 PAGES OF REVIEWS I WOULD LIKE TO MAX THEM ALL TIMES 1000 IT WAS TRULY THE MOST BEAUTIFUL GAME I HAVE PLAYED!!!! I LOVED EVERY SCENE MORE THAN THE LAST THE MUSIC WAS AWARD WINNING THE QUEEN IN THE BEGENNING WAS THE MOST STUNNING FEMALE IN ANY GAME I LOVED THE AWESOME OWL WHO LOOKED SO REAL LIKE YOU COULD TOUCH HIM!!! THE CAR LOOKED LIKE I COULD GET IN AND DRIVE AWAY!!! I NEVER WANTED IT TO END!!! I EVEN WENT BACK TO FIND ALL SHARDS TO PLAY THE LAST GAME TOTALLY IMAGINATIVE GAME OF THE YEAR TILL YOU MAKE THE NEXT ONE !!! THANK YOU!!!! Rated 5 out of 5 by Fuphyter from A MAGNIFICENT GAME ALL AROUND I have played a couple of hundred games since finding this site. Every once in a while one comes up that is totally amazing,, this is one of those. The graphics are gorgeous, voiceovers are great, mini games are inventive and new, and so is the music. The storyline is awesome, not one I remember playing before. There are collectibles in each scene and it actually lets you know if you have found them all. I like that! The bonus chapter is another part of the main game AND there is a hidden chapter. Worth the price of the CE in my book. Happy Gaming!! Rated 5 out of 5 by judeejuju from Fabulous Game Interesting storyline. Loads to do, bonus chapter and additional chapter based on achievements. At last a game that was worth the money! Rated 5 out of 5 by jillaroogirl from Absolutely Brilliant!!! This game is an absolute feast for the eyes and mind. From stunning scenery, excellent voice overs, many varied mini-games, glass shards to find (not that easy), multiple locations and best of all, an amazing length. There were tinsy tiny things that irked, like the silhouette picture puzzle (luckily not too many) and the cartoon 'movie scenes'...however, with the game being as dazzling as it is, these are easy to overlook. As previously mentioned the length of the game was amazing. It seemed to go forever and in fact took me days to complete, even after skipping puzzles. Playing full time, the game would have taken roughly 12 hours to play without skipping any games. For 'bang for your buck' this game is way at the top. Rated 5 out of 5 by Pandoras_box from Reflections of Life Loved it, challenging and fun. Rated 5 out of 5 by Laley61 from Reflections of Life: Equilibrium Collector's Edition This was one of the most complete, interesting and fun games that I have purchased and it was definitely worth it. Hope to see more like it. Compliments to the Editors and Everyone that was involved in the team to make it possible and available for our entertainment. THANK YOU ALL! Rated 5 out of 5 by Doriane333 from VERY HIGH QUALITY OF GAME This is a very very good game. The most high quality I played for long. This CE worth the price even if you buy it in a week-end deal. I highly recommand it. Rated 5 out of 5 by Tinklynne from Best Game I've Played I don't write reviews, but this one is worth my time. This is a busy game with lots to do. The HOPs are a mild challenge while the games vary in difficulty. Some I did have to skip as my mind just doesn't wrap around some of the strategies. Like the other Reflections of Life game I have, you get to travel through beautiful scenes. You have 114 glass shards (leaves in the other one) to look for which are pretty well hidden. I like that it took more than 3 hours to play and had 2 bonus games. For a good laugh, watch the characters' mouths move totally unsynchronized to the words. Love the owl helper. I love this game and can't wait to play it again. Rated 5 out of 5 by roberta3 from Good value for the money I played this game over 3 days. Some HOG games I can finish in 2-4 hours. This game was a complete story line. Some games feel, to me, as though the writers ran out of ideas, or interest. The multiple worlds and adventures was extraordinary. Thanks BF and game developers. Rated 5 out of 5 by 9otters from Worlds Of Fantasy, Fears, and Fantastic Fun! BASED ON COMPLETED GAME Brilliant imagination and fabulous detail on every level, Grand MA Games/Studios certainly brought their A-game to the table with this one! It is truly unfortunate that Game Of The Year is determined by sales and not reviews, because I think this one definitely belongs in the running. At the start, I thought that the fanciful artwork and sheer number of things to do might be a bit overwhelming. NOT SO! After relaxing into the flow of the game I didn't feel that way AT ALL. We begin in a world created by pure fantasy, so I found the look of that world to be very appropriate. As we travel to the world of fear, and later, the "real" world, the graphics change to reflect those themes. I was also concerned that the "time ring" might be overused, not being a fan of "contraptions". I found that NOT to be the case. I felt that the devs had us in "practice mode" in the first world, so when we encountered the clocks where the ring was used further on, we would be familiar with the mechanics. Not overused in the least. Thankfully, no overuse of the "helper", even though he WAS very handsome. I LOVE a game of puzzles and I found plenty! Simple to complex, quite a few that LOOKED harder than they actually were. I had to laugh when the game was over. I don't play for achievements, but when I looked, I got the one for spending more than 15 minutes on one puzzle. I'd be willing to bet that I spent that amount of time on MORE than one of them! There is an option to change the difficulty of the puzzles! That almost makes it an entirely different game when replayed! Great fun as well as money well spent! I LOVED the variety of HOS and that, for the most part, we were looking for unique items. Not the standard fare of horseshoes, mirrors, etc. There are three glass shards to be found in each scene. When all are found and a mirror puzzle reassembled, an extra bonus game is unlocked. After discovering that we could go back to find any we missed, I decided to play that as a separate game so I wasn't distracted from regular gameplay. Unexpected fun! The jump map was useful for keeping track of places with things to do, especially if you have to take a break and need to get back on track. I didn't find it absolutely necessary for going from one place to another because most of the action was confined to two or three places. Of course, a strategy guide is included, but I only used it a couple of times, mostly because I didn't absolutely NEED it. Lately, I like to try to get along without it. Just personal preference. The CE offers a bonus game that starts in the fantasy world and continues to a totally new and different world. It has a UNIQUE extra HOS bonus game, HOS to replay, puzzles to replay, music, "movies", and some surprisingly lovely wallpapers. Concept art, as well. Reflections of Life: Equilibrium is a game I will delight in playing again! If you choose to play, be sure to set aside plenty of time because this is a LONG one! If you're like me you might just find yourself glued to the screen, not wanting it to end! Sorry if this review is over-long! There is just SO MUCH to say about this excellent effort. Thank you so very much, Grand MA and BFG! Rated 5 out of 5 by DragOn2612 from Awesome !!! Outstanding artwork, gorgeous graphics and excellent soundtracks.The story is wonderfully original >Buy it if you like fantasy HOPA game !!! Rated 5 out of 5 by RasmusB from Beautifull game. Really nice game, not to taxing, but very diverse challenges. And the graphics is the best I have seen in a long time. Up there with the best ERS games. You get immersed in the game from the word go. Rated 5 out of 5 by tempestrain from So Good! Gorgeous, but the game does not hurt the eyes! Really really great game! Colorful and beautiful. Is also a long story, so good. I like the blue color. This game is all blue. In addition to blue color, the color of the full-color game. So colorful and beautiful. Really, really beautiful. The ancient and modern, the cross favorite games. Even if the game time is more sustainable, would not boring! The game comes out standing ovation. Rated 5 out of 5 by patricia356 from Interesting twist on an old story Ok, I agree that we have heard the plot. But the gameplay is is so much fun and the puzzle/hogs are different and varied. The graphics are good and the music appropriate and not invasive. It had a rather magical fairytale quality about it. One complaint though. The wings of the owl were rather noisy in their fluttering. I was surprised that no one knew that owls are silent flyers. Otherwise it was fun. The progress of action had logic so you could decide what to do next. There is a map which always helps. The game is dense and has much to do but the actions flow well and are enjoyable. Rated 5 out of 5 by lepredot from Breathtakingly Beautiful If you like fantasy this game is a must for you! The artwork is simply breathtaking. The gameplay has unique features and concepts. The puzzles aren't too overwhelming and the plot keeps your interest. I bought the game before the trial was over. I also like the fact that the queen is the central figure of the plot.The only thing I would add to this game is the kind of HOP in which all pieces found come together as one object (as in Blue Tea Games.) 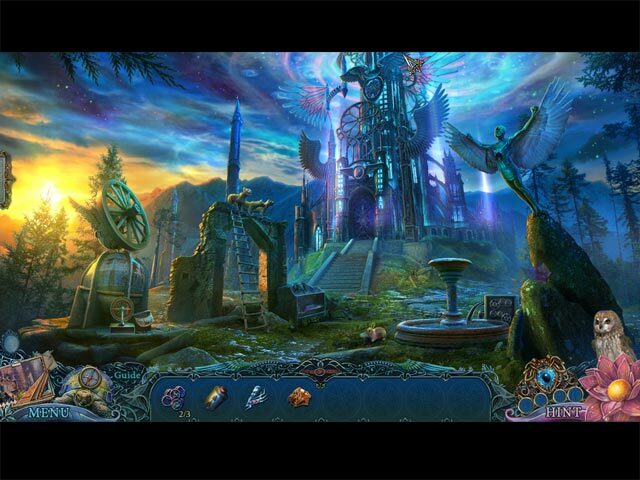 I highly recommend this game for Collectors of hidden object and adventure games. Rated 5 out of 5 by Paintedspoon from What a TREAT!! This is just packed with wonderful things to do. The innovative things that are put together here are wonderful. Thanks for a great game. Rated 5 out of 5 by tdmj5 from Best Game of the YEAR !!! Wow amazing game. Everything was new. New hos, new puzzles. Well you have an owl helper but that was new . You have to try this game you HAVE TO!!! YOU ARE GOING TO BE BLOWN AWAY . I will be buying this game on pay day. Thank you Grandma Studios and Big Fish, We have been complaining a lot and you heard us. 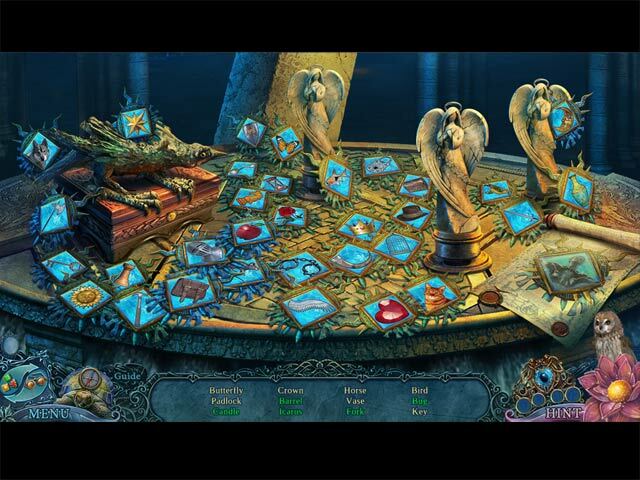 Rated 5 out of 5 by bsulnic from Superb fantasy game This game has it all and then some new innovative hidden object games, puzzles within puzzles and all taking you into a beautifully designed world that really takes you in. You have to think carefully in some instances thereby using your intellect in a fantasy setting. Beautifully crafted, music to listen endlessly to and an intriguing story line that keeps you interested and involved. Absolutely one of the best games I have played and it keeps adding by bonus chapter and collectables that adds to the whole intrigue of what you will find. Absolutely recommend this game from the beginners to the advanced player. Superb. Rated 5 out of 5 by biscuitsmama from Reflections of Life:Equilibrium is the Most Creative and Outstanding Game of the Year!! When I first did the beta test for Reflections of Life: Equilibrium, I wasn’t sure about the game since it seemed far too busy with graphics that were just so over-the-top fairy tale and inundated with those tones of pink that I really dislike. Then today the game was released and even though I still wasn’t sure that I liked it, I decided to give it another chance which turned out to be one of the best gaming decisions I’ve made in a long time. There is really no need for me to go into the story line or set the stage since other reviewers have done a good job with that so I am only going to tell you what I think. As I attempted to evaluate why I initially felt the game was overly busy, I had to accept the fact that in more recent games of the past year or two we have been conditioned to games where each scene might have one or two active areas at most, which is certainly not the case with Equilibrium. Recently games have become very simple with gameplay being almost automatic: find this, use it here and then move on to the next scene. Yes, there might be a puzzle to complete or a HOS thrown in but most times the games seem very easy and don’t require a lot of mental effort. With Equilibrium the developers have created a phenomenal game where we have multiple things to do in each scene and often it is not readily apparent what must be accomplished before moving forward. It didn’t take long before I was totally immersed in the challenge that is Equilibrium. 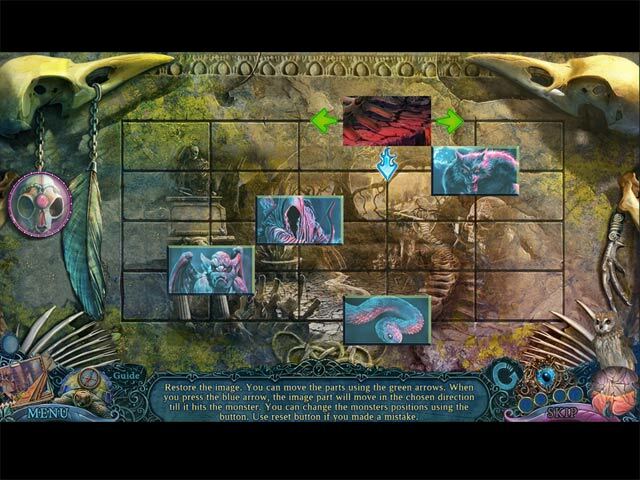 This development team has presented a creative and totally awesome game that is so different than what we normally expect to find in the HOPA genre and I am hooked. The HOS in Equilibrium are quite different from those we find in almost every other HOPA game and I loved them. Even though we are still finding hidden objects the presentation is excellent. I find the game refreshing, challenging and quite unique given the creativity this development team has used in creating what I think is a phenomenal game. Reflections of Life: Equilibrium is a great game that stands on the quality of its content and doesn’t need a lot of meaningless extras to make it a CE game. Nevertheless, the developers have provided quite a bit of extra content to keep many of us very happy. Not only do we have collectibles to find, achievements to earn, a SG, and bonus chapter, we also have an extra bonus hidden chapter to play. 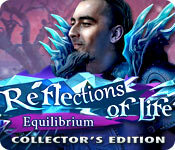 Reflections of Life: Equilibrium now has my vote for best HOPA game of the year. I am so happy that my initial thought about the game turned out to be wrong, and I guess that when I am wrong, I am really very wrong. Equilibrium is truly a ten-star game among a world of many five-star games. All I can say is kudos to this awesome and creative development team for an outstanding game that is truly at the top of the list. Well done developers!! Rated 5 out of 5 by MSBAM100 from Four worlds depend on one Queen! What a fantastic demo of the second game in this series! There is so much to do and see. The graphics are bright and gorgeous in Creatos; a bit more desolate in Equilibrium. Each world is unique. So you are again Grace, the Guardian of Dreams, summoned to Creatos by the King, whose daughter Espera is in a coma and covered by vines suspending her out the window on the second floor. If you can just free the Glove of Sophos, you can eliminate those nasty vines! You have your trusty Owl, who of course can fly up to heights you cannot reach. You also receive the Vision Ring, which looks into the future and helps you find four runes, which gets you a mystical image to place in the scene which gets you a cool item you need! So you save the daughter, but it turns out that was just a red herring to distract you from the real victim, the Queen. Akvos of Equilibrium kidnaps the Queen. If the Queen of Creatos is missing, fear and darkness fill her world and spread to the other 3 worlds of Equilibrium, Phobus, and Actualus - which kind of looks like NYC. So off you go to save the Queen. There is a beautiful Achievement room for both activity and skill based awards. There are 114 mirror shards to collect, some in each scene. There is a reminder of how many are left to find in each scene. There are 4 modes of play, and a well-marked map to help you find where to go next. The CE bling also includes a Bonus Chapter, and a Hidden Chapter, plus a Mirror puzzle to assemble. The HOS are quite fun. There are story boards to find objects within. There is a map with the 4 worlds, each on a different screen, that you scroll through to find an object. When you finally are able to follow the kidnapper through the portal to Equilibrium, the demo ends -- after 90 full minutes of play. What fun! I am off to buy! Can't wait to see the other worlds. Rated 5 out of 5 by bayley60 from WOW I don't usually write a review, and I'm not going to rehash the whole storyline. This is such a super game, just wanted to give kudos to the developers who have now set the bar that much higher for other developers. There is so much to do it will literally give you hours of fun. Each scene is magnificent with so much to do and a lot of new ways to do puzzles and HOPS. I would give this game of the year award (so far). Rated 5 out of 5 by moonwitch1 from Reflections and Relaxation Reflections of Life: Equilibrium is the best game I have seen or played in a long time. This is truly a lovely, well executed, and relaxing game. As a Guardian, you are summoned to save the small princess from evil magical vines. However, more is at stake in this fantasy world than meets the eye! Everything in here, from the music, to the artwork, to the voice acting, is superb. I do not normally play with sound, but this begs to be left on and makes you very relaxed during play. There are colored shards of glass to find on each screen as well as some very unique mini games that are not redundant and keep your interest. For me, this five star game was an immediate buy. I would urge you guys to not turn off the sound this time and at least play them demo if not buy this one outright!!!! I am so pleased with it!!! probably going to be a keeper!!! Rated 5 out of 5 by shripch from Oh my! And a sale too! This is a fantastic game! I haven't experienced real excitement in the first few scenes of a game for a long time, not since Soaring City. This game has it all. The graphics are stunning! Puzzles clever! Hos different and new in their construction. So much to see and hear and do. Collectibles. Worlds to explore. Thank you to the creative wizards who went to so much trouble and toil to create this marvel. All your hard work paid off in something truly unique! Bravo!